Leaf-miner: During autumn the larva mines a mere 9-12 leaves - the damage is quite inconspicuous. Hibernation occurs within the mine, and during mild days feeding may continue. After hibernation the larva lives as a borer, and empties 4-6 shoots, over a length of 0.5 - 2.5 mm, just below the tip of the shoot. The damaged shoots wilt and die off (Bladmineerders van Europa). Pupa: Pupa in a white fusiform coccoon that often is spun among the twigs, rather than on the ground (Bladmineerders van Europa). 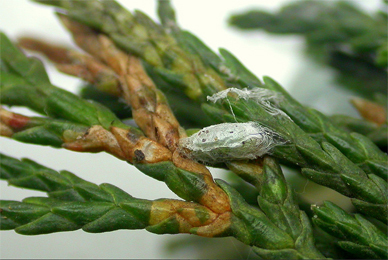 Time of year - larvae: Summer to Spring (British leafminers). Distribution in Great Britain and Ireland: Widespread inclduing in East Norfolk, East Suffolk, Glamorgan, Leicester, Middlesex, Shropshire, South-east Yorkshire, Stafford, West Lancashire, West Norfolk and West Suffolk (NBN Atlas). Distribution elsewhere: Native in the western coastal region of the United States, and emerged in Britain in 1997, where it now is spreading rapidly (Agassiz & Tuck, 1999a; Heckford, 2004a). The hostplants are also on the European mainland very popular as ornamental conifers, and the discovery of this Argyresthia here will be a mere matter of time (Bladmineerders van Europa).